West Yorkshire, South Yorkshire, North Yorkshire, East Yorkshire, Lancashire, Greater Manchester, Cheshire, Merseyside, Staffordshire, Derbyshire, Nottinghamshire and North Lincolnshire. 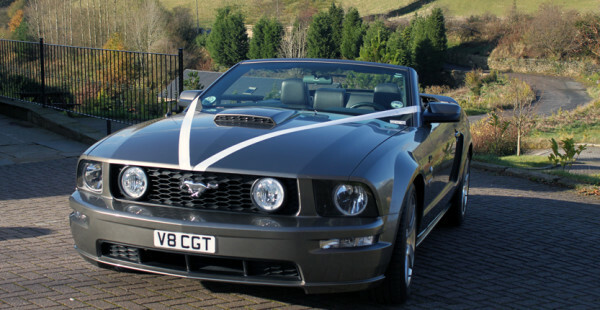 Car 1, our very own 2005 GT Convertible was the first car to start off Ford Mustang Wedding back in 2009. 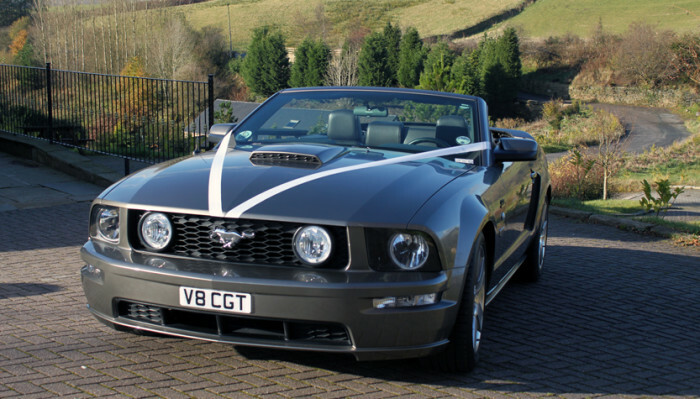 Originally from California this car was ordered with every available option at the time; including the black leather sports seats, interior upgrade, metallic paint and a rear spoiler. Ford really got it right with this model with its stunning retro looks and styling. 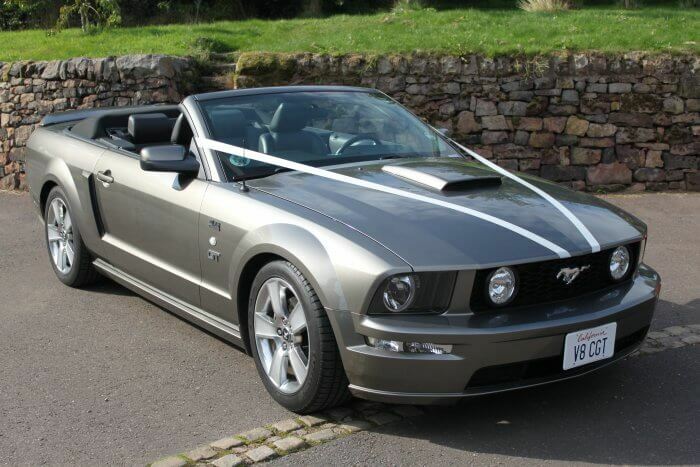 It was the perfect spec and in the best colour, mineral grey. 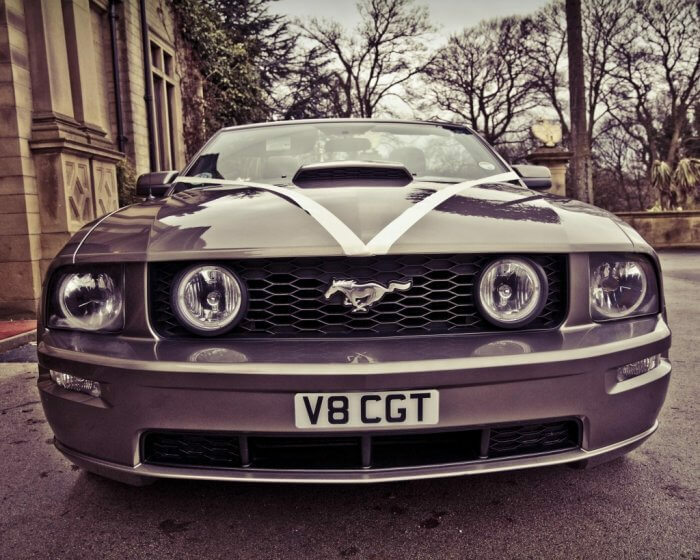 In June 2009 this Mustang was hired for its very first wedding, treating an excited bride and groom to a memorable experience on their special wedding day in Yorkshire! 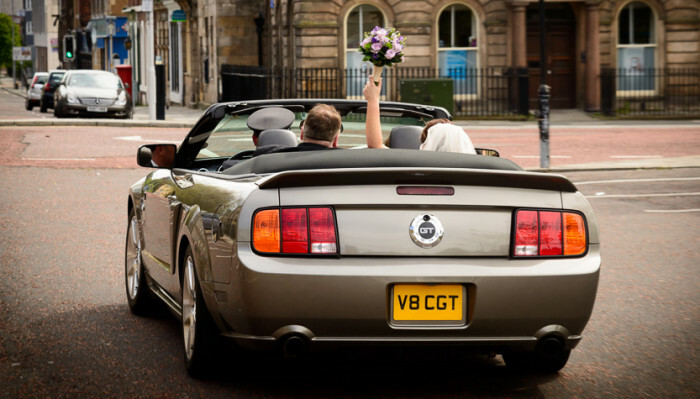 Ever since then, this car has been a very popular choice on the website and I have been privileged enough to help make over 80 couples day really special. 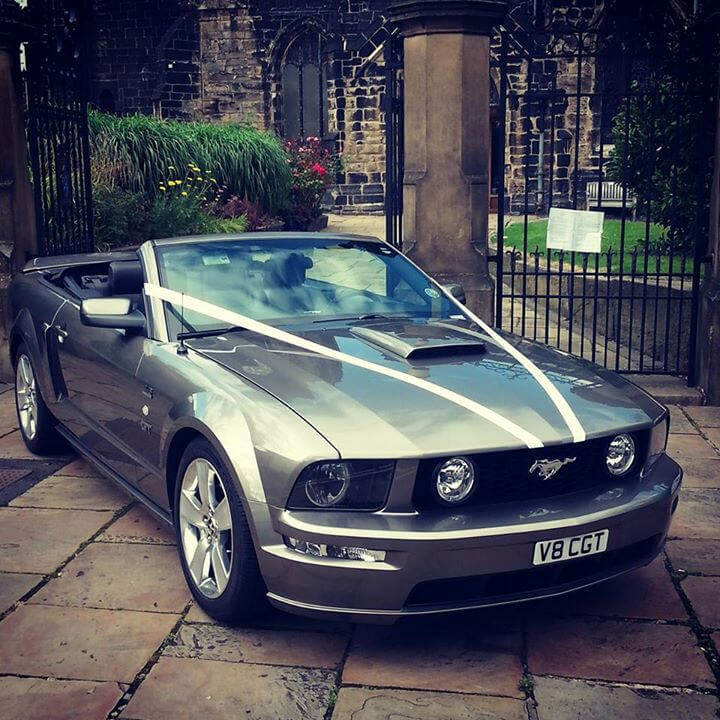 This car is my pride and joy and it is looked after meticulously, ensuring it is always in perfect condition for every wedding I chauffeur. 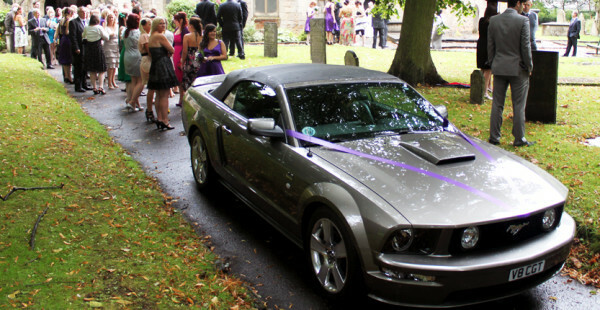 I too have carried out a few styling modifications to the car, such as fitting the beautiful chrome 18” alloys, adding the GT500 rear spoiler making this car possibly one of the best examples in the UK. 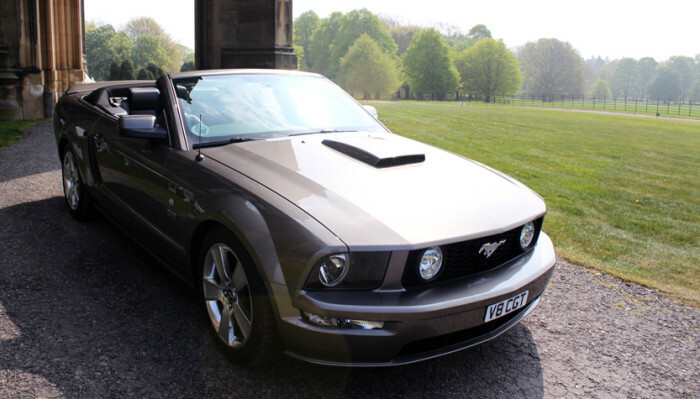 But the thing that really puts a big smile on someone’s face is when they hear the V8 engine roar into life! 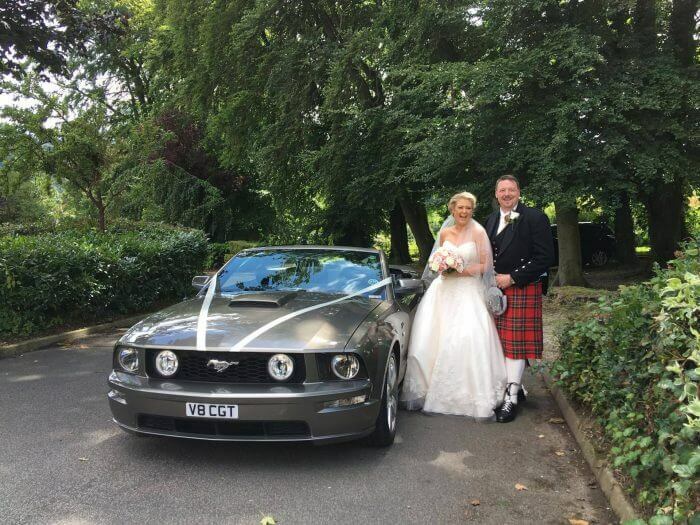 So there you have it, I love this car and every couple I have had the pleasure of chauffeuring on their big day has absolutely loved it too! You are welcome to come and view my car before you book, you won’t be disappointed. 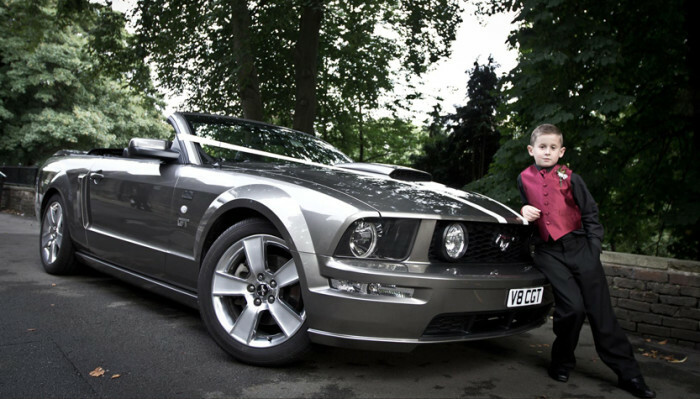 I hired Car 1 as a surprise for my husband and boy was he surprised. He loved it! Frazer was very professional arriving in full chauffeur uniform. He was great on the run up answering all my questions. On the day everything was amazing. 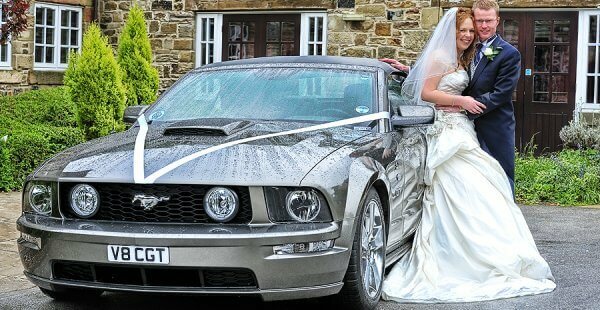 Everyone loved the car and the photos were amazing. Frazer was spot on with everything! Cannot recommend enough. It's perfect for a groom surprise, can't wait to see my husbands face on the video when it arrived at the house. 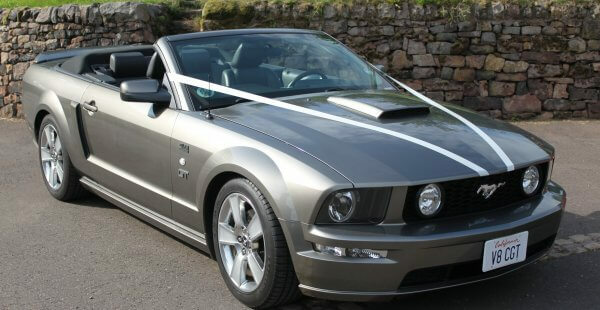 Fantastic car fantastic driver (Car 1 - Frazer ) Would not hesitate to recommend this site. Thank you for a brilliant job . Excellent customer service always replied to emails fast and efficiently. Friendly driver and AMAZING Mustang. 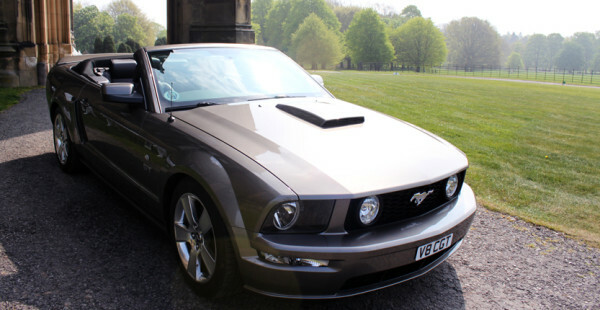 Definitely worth hiring from if you are a Mustang lover! Michel and I would like to put on record our sincere and heartfelt appreciation for the services which you provided. 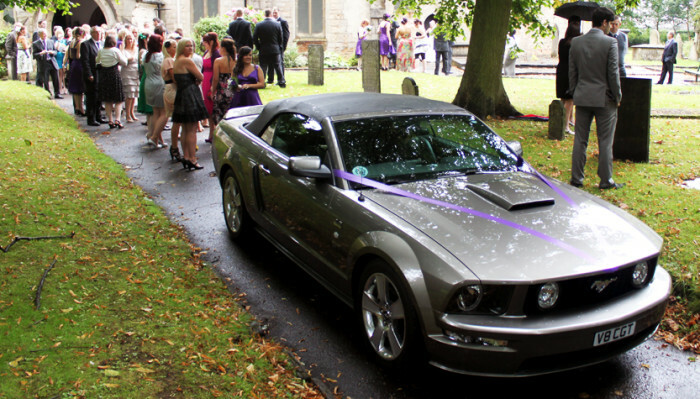 Despite the fact that we approached your company, incredibly late in the booking procedure, with a request for you to provide the best car possible for our son's prom event two days later, you delivered the highest standard of customer service possible throughout. You responded quickly and gave us all the information needed in a concise and easy to read format, via emails and texts to our phones. You provided telephone numbers, where we could contact you even after office hours should we have any additional queries, regular progress updates and you delivered on every element of the service described to us. On the Friday evening you arrived in plenty of time, having already outlined an itinerary that included a 'stop off' at the house for photo opportunities, a drive through the nearby countryside, so that Connor. 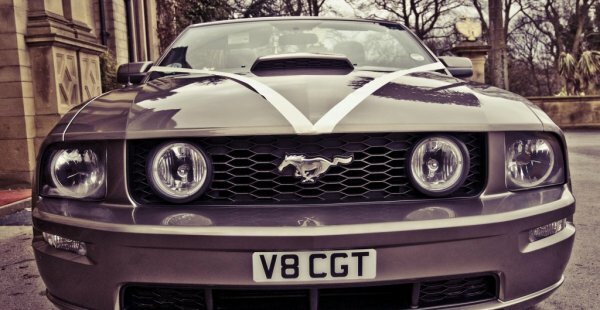 could experience for himself the full potential of his beloved Ford Mustang and a suitably emphatic arrival at the venue. 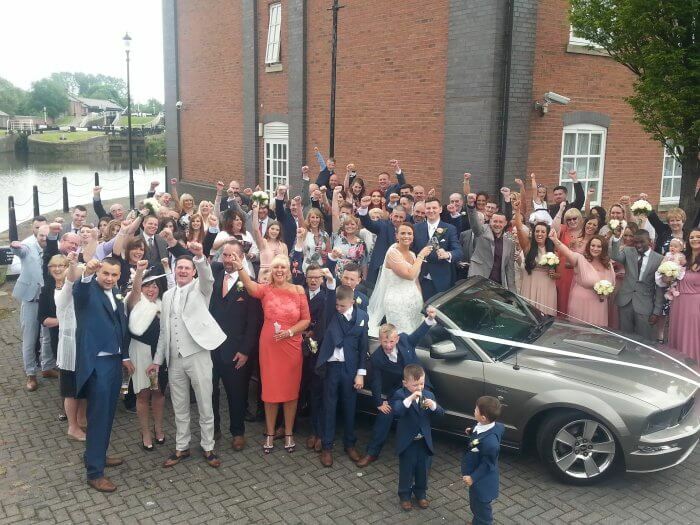 We were equally impressed by the fact that you were so well equipped on the day. The car had all heads turning and the neighbours came out en masse to watch Connor’s departure in your magnificent, immaculate Mustang GT convertible. 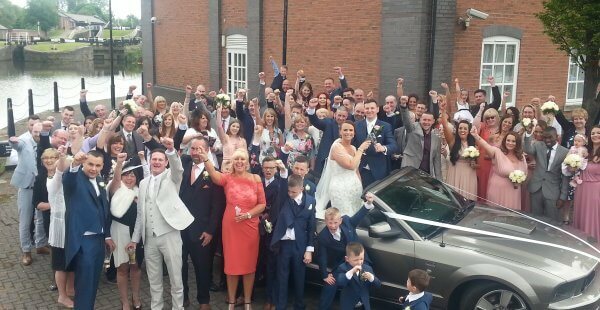 On your approach up to the venue once again the iconic growl of the car’s engine focused all attention there and your speedy exit to guarantee one last photo shoot in situ, was appreciated by all members of the family watching. 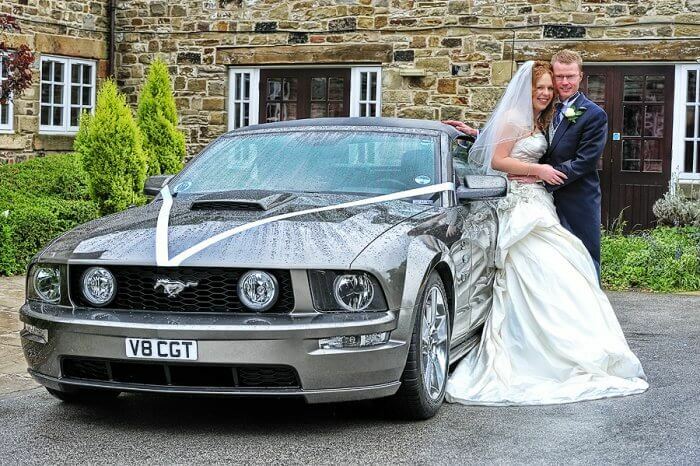 Congratulations Frazer, Ford Mustang Wedding sets the ‘go to' standard of excellence. We wholeheartedly recommend your service. Connor will never forget the evening! 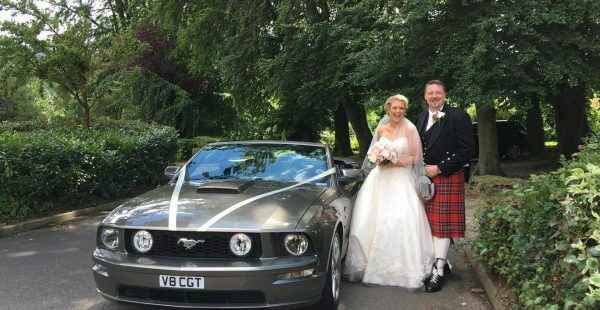 You and the car were perfect in every way, photos are brilliant and I can't thank you enough for the service you provided and we will be recommending you wherever we go. Again we all thank you.